In June 2014, a salvage excavation was conducted in a private lot in the Beit Hanina neighborhood of Jerusalem (Permit No. A-7150; map ref. 220903–28/637656–82), prior to development work. 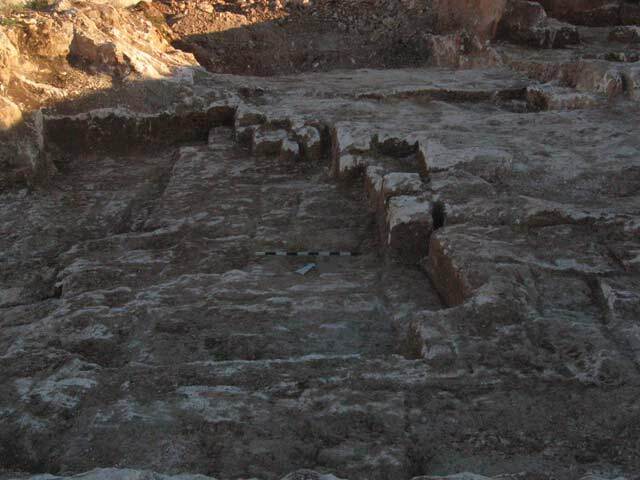 The excavation, undertaken on behalf of the Israel Antiquities Authority and financed by Mr. Na‘im ‘Iit, was directed by D. Yeger, with the assistance of N. Nahama (administration), A. Hajian and M. Kunin (surveying), S. Leshem and B. Dwyat (archaeological inspection), D. Tanami (metal detection) and B. Touri. 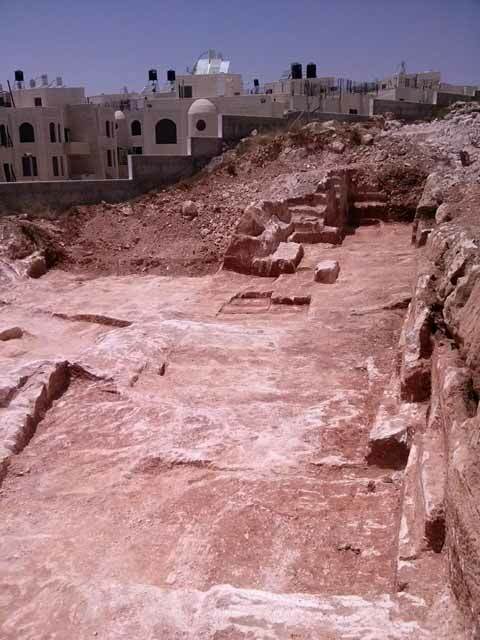 The excavation was conducted on el-I’am Street, north of ‘Abd al-Hamid Shoman Street (Route 20), on the southern slope of a hill of the Shu‘fat–Beit Hanina ridge, which is bounded on the east and north by the Bir Naballah Road and on the west by Highway 50 (Fig. 1). A network of quarries extends across the ridge. Next to the ridge run two ancient roads that led to Jerusalem—the Nablus Road and the Bet Horon Road (Kloner 2001: Site 28; 'Adawi 2012). The proximity of the quarries to the roads aided in the transport of the building stones to the settlements in the vicinity and to Jerusalem . 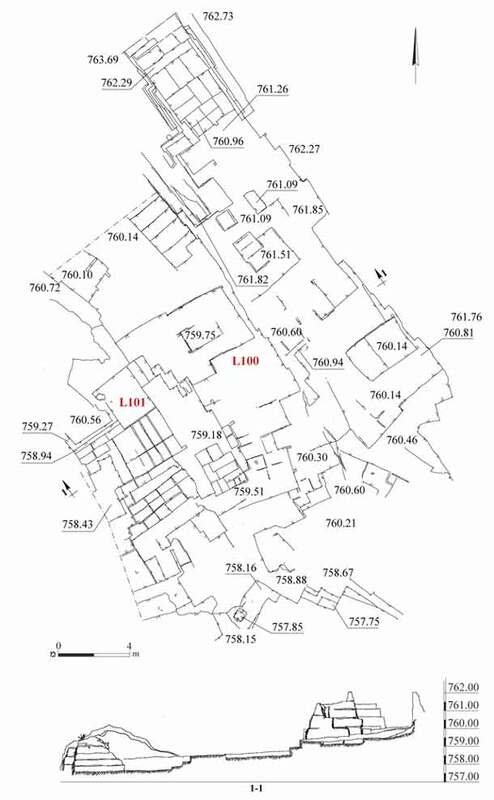 Numerous ancient quarries were surveyed and excavated in the area (Kloner 2001: Sites 27, 75, 116; 'Adawi 2009). Some were dated to the Roman and Byzantine periods (Mizrahi 2008a; Mizrahi 2008b; Zilberbod 2012; Permit No. A-6813). The current excavation extended to the south the excavation of a quarry that was exposed several years ago ('Adawi 2007). The quarry continues farther to the south into the adjacent lot, and was not excavated in its entirety. 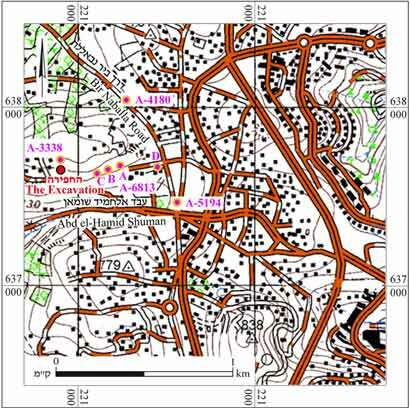 The rectangular quarry (L100, L101; 16 × 24 m, depth 0.6–2.2 m; Figs. 2, 3) is of the large-courtyard type (Safrai and Sasson 2001:4). Its eastern wall is straight, and at its lower part quarrying steps descended towards the center of the quarry. The method of hewing and extracting the stones is known from other quarries in the vicinity. Three channels were cut to mark the outline of the stone and separate it from the surrounding bedrock, and it was then detached, from the fourth, free side. The sequence can be reconstructed from stones that were not detached (Fig 4), imprints of detached stones, severance channels at the bottom of the quarry (Fig. 5), and chisel marks on the walls of the quarry. 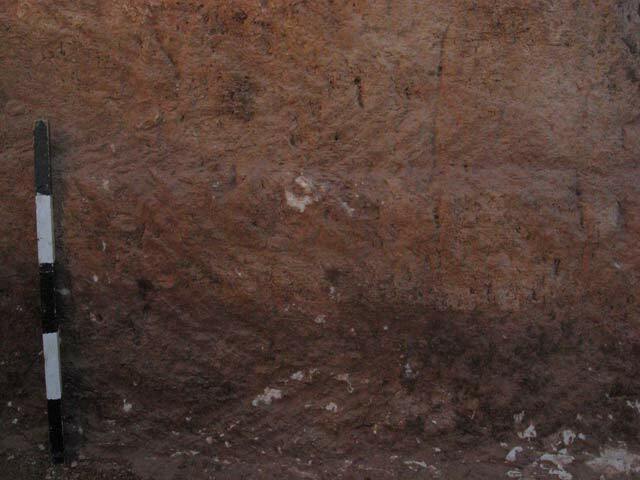 Identical chisel marks were visible on the walls of other quarries, where the rock was cut diagonally (width 1–2 cm, depth 0.5 cm; Fig. 6). The severance channels have a trapezoidal cross-section (upper width 10–13 cm, lower width 3–4 cm) and their length conforms to the dimensions of the stones that were cut in the quarry. The stones were generally uniform in size (0.30 × 0.36 × 0.60 m), but there are also larger stones (average dimensions 0.8 × 0.9 m). 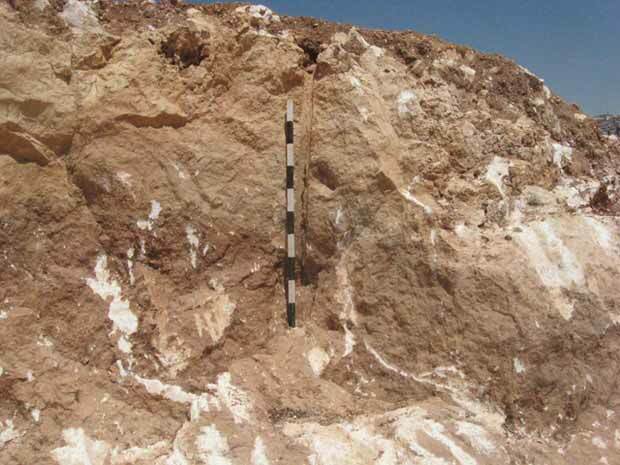 Two accumulation strata were identified in the quarry: a stratum of dark-brown alluvium of varying thickness (0.2–0.4 m), and below it a stratum of rock-cutting debris that reached down to the bottom of the quarry (L100), and consisted of light-brown sediment and numerous white limestone chips (average size 2 × 4 cm, 8 × 10 cm). The stone chips become progressively smaller towards the bottom of the quarry, and the chips at the bottom were very small (average size 1 × 2 cm). A hard, compacted calcareous encrustation was also found at the bottom. 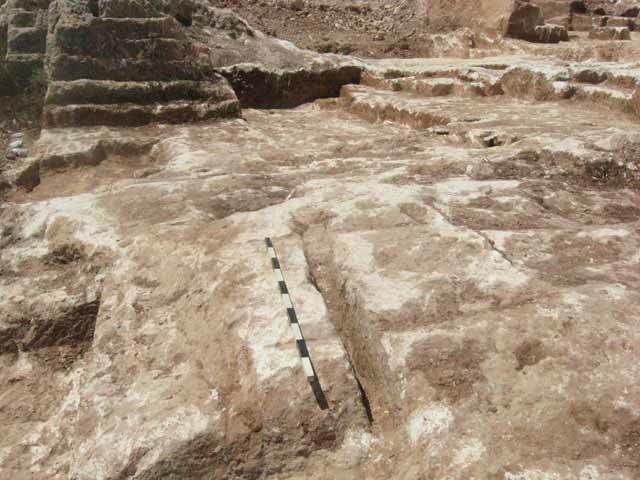 The two strata were removed from most of the quarry by mechanical equipment; only one square was manually excavated (L101; 4 sq m; Fig. 2). The quarry wall was damaged in the southeastern corner, where cracks and a hole drilled to insert explosives testify to the quarry being used again in the twentieth century (Fig. 7). No datable finds were discovered. The method employed to extract the stones, and the shape of the quarry, are indicative of professional expertise, pre-planning and organization, which allowed several groups of laborers to work simultaneously. It is difficult to date quarries, because methods of stone-masonry hardly changed through time (Safrai and Sasson 2001:2), and the finds in them are meager. Nevertheless, it seems that the quarry can be related to the adjacent quarries that were dated to the Roman and Byzantine periods (second–sixth centuries CE). It seems that this quarry, like others that were previously excavated and surveyed in the vicinity, supplied building stones to Jerusalem, and maybe also to sites in its northern hinterland, which are close to the quarries, such as Khirbat Hawanit, Khirbat Magharam and Khirbat ‘Addasa ('Adawi 2007). ‘Adawi Z. 2007. Jerusalem, Shikune Nusseiba (A). HA-ESI 119. ‘Adawi Z. 2009. Jerusalem, Shikune Nusseiba (North). HA-ESI 121. ‘Adawi Z. 2012. Jerusalem, Beit Hanina. HA-ESI 124. Mizrahi Y. 2008a. Jerusalem. Shikune Nusseiba (A). HA-ESI 120. Mizrahi Y. 2008b. Jerusalem. Shikune Nusseiba (B). HA-ESI 120. Safrai Z. and Sasson A. 2001. Quarrying and Quarries in the Land of Israel in the Period of the Mishnah and Talmud. Elkana (Hebrew). Zilberbod I. 2012. Jerusalem, Beit Hanina (B). HA-ESI 124. 3. The quarry, looking north. 4. Quarried stones before detachment, looking north. 5. Severance channels, looking north. 6. Chisels marks on the northern wall of the quarry, looking north. 7. A modern drilling in the eastern wall of the quarry, looking east.